SMO Contemporary Art, Nigeria, in collaboration with Gallery 1957, Ghana, recently exhibited Nigerian-based-German artist, Chidi Kwubiri’s solo exhibition entitled motionEmotion in Ghana. In motionEmotion, Kwubiri takes his audience on a journey across sound, rhythm, performance and dance, by presenting paintings which speak to the outer and inner manifestation of music on identity, the rise of freedom movements, and the impact of lyrics on society across different generations. The works introduce a multi-layered, almost opaque world of colour and silhouette that gently seeps into visual consciousness. Utilising his characteristic dripping paint technique on large canvases, Kwubiri reveals expertly rendered hazy outlines of figures in motion and dance, in a sea of minute dots and drips. Kwubiri presents a new monochromatic body of work with minimalist colour highlights alongside his signature colour palette, which reinforce the power of unity and hope against the socio-political tensions surrounding global immigration issues. His bold interpretations also touch on the impact of music on global youth movements by interpreting cross-generational rhythms, culture and political consciousness. The exhibition at Gallery 1957 showcased Kwubiri on a journey of sensory memory through paintings of cultural crusaders, such as Afrobeat legend, Fela Kuti, and Reggae exponent, Bob Marley – juxtaposed against contemporary dances with their roots in Africa, including twerking, popping & locking, hip-hop, and rap. motionEmotion is set against a backdrop of live music, freestyle instrumental and art based performance. Kwubiri grew up in Nigeria and relocated to Germany in his twenties. 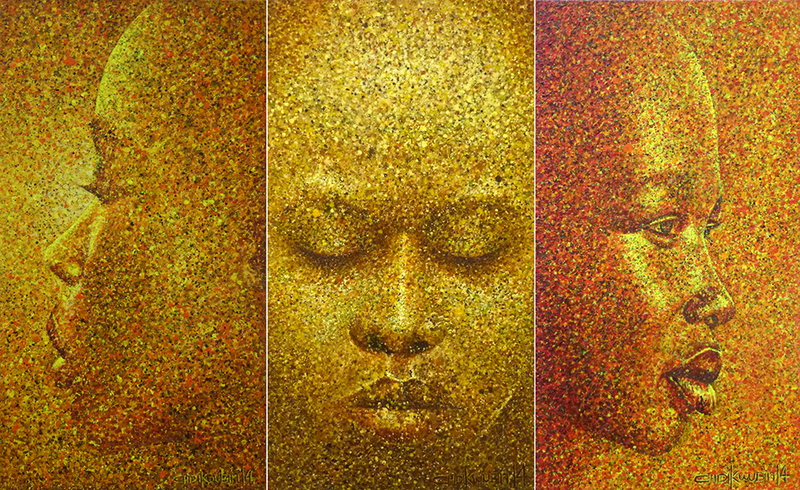 He is a graduate of the Art Academy of Dusseldorf where he gained his Bachelors and Masters of Fine Arts, and has spent the last 25 years exhibiting globally at prestigious galleries and museums in France, Germany, the United States, Russia, Belgium, South Africa and his native Nigeria. His group and solo exhibitions include LebensWerk Arbeit, Museum Am Dom, Trier (2018); Ich bin, weil du bist, Museum Am Dom, Trier (2017); Italia Docet, 56th Venice Biennale, Venice (2015); Mother Tongue, Temple Muse, Lagos (2013); Theme Africa, Phillips de Pury, New York (2010); and The Internationals, Millenia Gallery, Orlando (2004). Gallery 1957 is based in Accra and is dedicated to contemporary art, with a curatorial focus on West Africa. The gallery presents a programme of exhibitions, installations and performances by the region’s most significant artists. Gallery 1957 works with artists currently bridging the gap between local and international practices, including Serge Attukwei Clottey, Jeremiah Quarshie, Yaw Owusu, Gerald Chukwuma, crazinist artist and Godfried Donkor. Founded by Marwan Zakhem in 2016, the gallery has evolved from over 15 years of private collecting. In 2017, they inaugurated their second exhibition and project space in Accra’s new Galleria Mall with a solo exhibition by British-Ghanaian artist, Godfried Donkor. Gallery 1957 offers both local audiences and international visitors the opportunity to discover artists, and to gain a deeper understanding of the breadth of their practice. Their work expands outside of the gallery walls through a public programme that includes talks, off-site projects, residencies, performances, commissioning new site-specific installations, and supporting cultural initiatives in Ghana and beyond.